In a large bowl, mix mashed potatoes, eggs and olive oil/butter. In a separate bowl, combine baking soda, baking powder and cassava flour. Add to wet ingredients and mix well. Stir in chives. Using a large spoon, add the mixture to your waffle maker. The mixture should be thick, so you’ll likely have to manually press the waffle maker all the way shut. Cook in waffle iron for about 8-10 minutes. 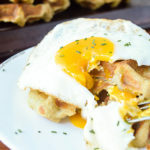 It may be because I have an ancient waffle maker, but I couldn’t depend on the beep to indicate the waffles were done for this recipe, so keep an eye on the clock and adjust accordingly! I rarely measure when I make mashed potatoes, but this is generally what I use: 2-3 large potatoes, 1/2 cup bone broth, 2 tablespoons ghee. Sometimes I use more ghee and less broth. I keep it pretty simple and my mashed potatoes are always nice and thick! The consistency of your mashed potatoes may affect the waffle recipe.